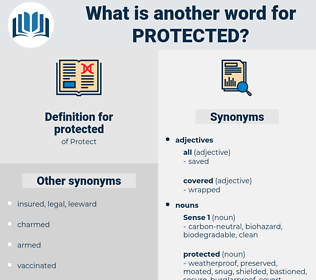 What is another word for protected? secured, protection, guaranteed, protects, protecting, protectable, checked-in, reserved, classified, protective, restricted, entrenched, exempt, confidential, pedestrian, ensured. Guarantees, protection, protections, protects, protecting, associates, regards, protective, trusted. Charges, Clients, Guarantees, boys, protections, associates. preserved, Guaranteeing, Defended, Provided, Upheld, support, maintained, Encompassed, shields, Came, Nurtured, kept, shielded, sustain, Were, Offered, harboured, enrolled, bless, secured, shed, guaranteed, trusted, ensured. preserved, projected, Promoted, respected, conserved, collected, incorporated, removed, preferred, guarded, reflected, enforced, proposed, processed, prohibited, Defended, expected, Provided, reinforced, directed, ascertained, Upheld, Advocated, observance, saved, affected, Avoided, Overseen, Created, effected, completed, Contributed, supported, represented, prescribed, monitored, coordinated, strengthened, constitution, recorded, Discriminated, maintained, conducted, Insulated, Cared, enclosed, regulated, observed, checked, Operated, asserted, accepted, recognised, contained, anticipated, compliance, retained, Administered, inscribed, Exercised, recognized, Performed, authorized, permitted, integrated, species, allocated, vaccinated, kept, considered, implemented, Exempted, accomplished, treated, armoured, shielded, Spared, Policed, described, Managed, harmed, addressed, sustained, Espoused, Complied, Championed, confined, acknowledged, rooted, coated, violated, governed, Achieved, Been, stored, Overlain, Underpinned, watch, Offered, registered, outlined, embodied, Caused, authorised, received, Anchored, foreseen, oriented, Hindered, Accorded, controlled, Enunciated, equipped, endorsed, Delivered, arranged, honoured, realized, Targeted, Mentioned, Afforded, Areas, immunized, Adhered, Surfaced, pursued, identified, forbidden, specified, chap, Served, Subjected, handled, Undertaken, paved, Followed, justified, Argued, Entered, geared, withheld, advanced, related, put, Borne, assumed, locked, scheduled, held, guided, satisfied, Allowed, Fought, included, entitled, Referred, Evolved, filled, Carried, Channelled, warranted, hedged, Aimed, fulfilled, set, Brought, masked, closed, used, Supplied, invested, Plated, Dealt, desired, planned, embedded, expended, extended, pleased, shaded, Submitted, said, granted, booked, taken, admitted, focused, Fitted, spent, intended, Met, felt, applied, known, affixed, found, stated, funded, backed, given, Had, secured, based, done, founded, made, lined, guaranteed, sheltered, reserved, classified, trusted, restricted, entrenched, confidential, ensured. insecure, exposed, susceptible, weak, unsheltered, vulnerable. The family, protected by the possession of some degree of property, will grow by its own laws. How is the world to be protected against it in the meantime?